The new Girls’ Football League matches will begin this Saturday [Jan 13] from 3.00pm to 7.00pm at BFA Field. A spokesperson said, “The Bermuda Football Association and the “Working Committee” for the new Girls’ Football League are excited to announce that the League matches will begin this Saturday, January 13th, 2018 at the BFA Field from 3:00pm to 7:00pm. Twenty-one teams consisting of U7, U9, U11 and U13 girls will take over the Clyde Best Center of Excellence every Saturday. “The Working Committee comprises the ABC Football School, BPro Women’s Sports School, Warwick Academy Football Club, BHS Football Club, BFA Women’s Football Committee and other BFA Full Members hosted open training nights at the Clyde Best Center of Excellence. 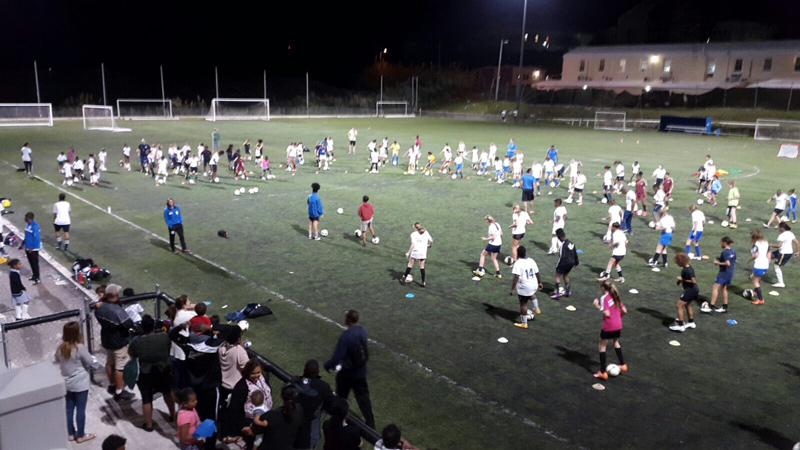 “Over 170 enthusiastic girls participated in the five week Girls’ Open Training Sessions, which served to energize Bermuda’s budding young female footballers. “The commencement of the Girls Football League is a culmination of investment into girl’s football through programs like “Girls Play Too”, “Live Your Goals” and the Girls Open Training sessions as well as the work done by our partner programs within the Working Committee says Don Vickers, BFA Assistant Technical Development Director. “Additionally, there is still opportunities for coaches to volunteer their time and talents to assist with advancing the program so if there are any persons with football coaching experience that wish to lend their time to help ensure this initiative is a success and gains momentum, we ask that you contact Don Vickers at adtdadmin@bermudafootball.com or  537-4557. SCARS training will be requirement and will be arranged for all interested coaches.